We were amazingly lucky last week to receive a bumper box of wonderful family board games from Mattel for review. It’s all part of their Fun Times initiative, which aims to get families together to play games more often. All the games we received for review can be played in a maximum of 20 minutes, so there really is no excuse not to be able to find the time to play. 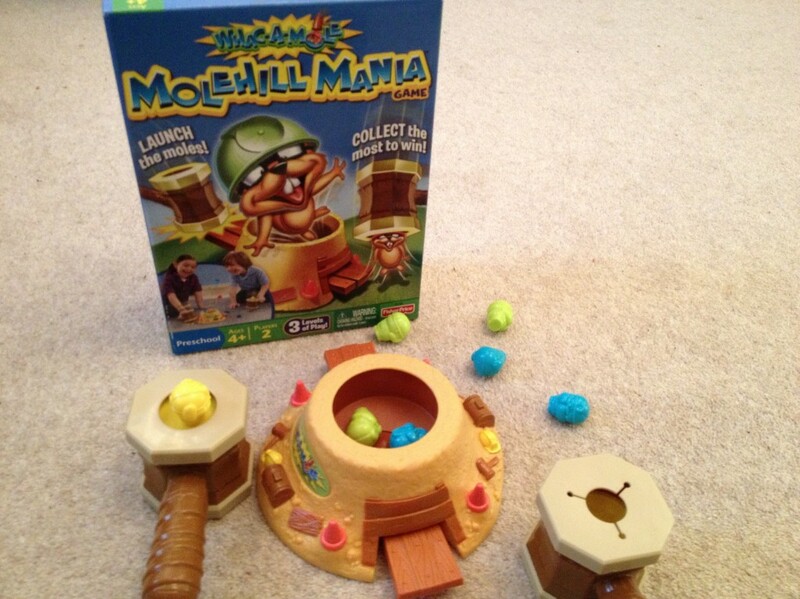 The first game we played out of the box was Molehill Mania, mainly because they boys opened the box after school and I still had the tea to cook. So they needed to find a simple game they could play together before eating, whilst the food was cooking. Whac-A-Mole Molehill Mania is the perfect game for such a scenario. It’s game for 2 players, for players aged 4 and up. Absolutely perfect for my two 5 and 7-year-old boys. The game is based around the idea of the Whack A Mole machines that you get in arcades. Although this game is quite different to those, the feel is much the same. Inside the box you get 2 mallets, 11 Moles (5 green,5 blue, 1 red) and a molehill for the moles to jump out of. The best part is the realisation that no batteries are required. Hurrah! You can play the games in 3 different ways, each needing a bit more skill. Good for as your children get older. Each game starts the same. Firstly you place all the moles in the molehill. Next both players grab a mallet. When your both ready you simply shout “Go” and start whacking the planks down on the side of the molehill as fast as you can. As you whack the moles will flip out of the molehill onto the floor. Once all the Moles are out then you move onto the next part depending which level of game your playing. The basic game sees you simply collect 6 moles as fast as you can by whacking down on them with your mallet. Once you have 6 in your mallet, a yellow plastic mole will pop out of the top to indicate you have a full mallet and have won. In level 2 each player choses to be either blue or green, and you have to whack all of your chosen colour moles as quick as possible. When all your moles are in your mallet then you can whack the red mole to win the game. In the last level you bring points into the equation, with green moles being 1 point, blue 3, and the red 5. Tallying up your 6 moles at the end of the game to see which player has the most points to win. This way of playing was actually my boys favourite. Although all 3 ways of playing were great fun. They both fully understood the rules immediately as it was so simple to explain. So everyone knew what to do. Each game only lasts about 2 minutes, so in the 15 minutes I was busy doing dinner they played about 10 rounds and were happy they’d had a good amount of playing time. I’m up to my last list already, This time around it’s finally time for the Baby’s! As always the lists aren’t in any sort of order of importance, it’s just the top 10 things that I think will be most appreciated by the littlest of little ones Santa will visit for the very first time this year. When my youngest was just a little one, he had an earlier version of the Laugh and Learn Puppy which he loved so much. That’s why I felt compelled to add the new Laugh and Learn Dance and Play Puppy to the list, as he’s the same cute puppy but a lot more livelier. With easy actions like clapping, and blowing kisses, the Dance & Play puppy encourages baby to play along and copy his actions. Singing songs about ABC’s, Counting 1-10, Opposites, Manners, Parts of the body. He will keep your baby enthralled for hours. Lilliputiens simply has to be one of my favourite toy brands ever. I could have easily chosen a full top ten just from their range. Which is probably the reason that this is not the only time they will pop up in this list. This gorgeous little handbag is just the ticket to stop baby rummaging around your bag and trying to steal your keys and lipstick. Letting baby have their very own Purse, Keys, Phone and compact mirror is a genius idea. Plus it looks super cute. Also comes with the lovely Liz soft dolly, who sits inside the front pocket. Lilliputiens products are designed by mums, with safety very much in mind. All pieces are non toxic and completely safe for all ages. Don’t let the name fool you, this isn’t for outdoor play. It’s a babies playhouse, which helps to bring all the fun of the garden indoors. Hours of giggles will be had by baby in this lovely little playhouse. Then unfold out the sides, and it becomes a two-sided play centre with all round fun. Amongst the many bits and bobs that will keep baby occupied are the mirror, learning clock, ball shaker, moveable clickable bugs, Moveable lookout telescope, opening shutter windows, shapesorter mailbox, ball drop flowerpot, and a three language interactive telephone. This one isn’t new exactly, it’s been around for over a year, but I still love this and have bought it several times as a gift for others. Small babies will love simply lifting up the lid of the picnic basket and posting the food inside. As they grow older they will start to learn colours, numbers, shapes and much more, all from this friendly picnic basket. The Scramble Bug is unique in that in not only moves forward and backwards, but it also goes sideways, well anyways you want really. Full 360 degree fun. This freedom of movement mean it’s the ideal first ride on for little ones, just starting to get to grips with pushing and steering themselves around. Light and easy to carry, the Scramble Bug folds down for compact storage and transportation. No assembly is required, just unfold out the legs and handle until it looks insect like and your done. All kids love playing with mummy and daddy’s gadgets, years gone past it was the TV remote that got most babies attention. Nowadays though its mummys phone that baby wants to get their sticky mitts on, and who can blame them. Well if you want to let little one have a play around on your iPhone without the tears and tantrums (that’s your tears not theirs) then the Fisher Price Apptivity Case is your answer. This sturdy case will prevent dribbles, drool, and unwanted calling and app purchasing. Use with the free to download Laugh and Learn App from the App Store and your baby will be able to enjoy over 75 songs, tunes and phrases. Learning about shapes, letters, animals and numbers. Obviously styled to look like mummy’s and Daddy’s iPad or Android, the Tiny Touch tablet will probably not fool even the youngest of babies. However hopefully it will give them something else to enjoy when the iPad is safely out of reach. Press the light up buttons to hear happy songs, animal noises, abc’s and numbers. Baby can also pretend to keep in touch with their friends by checking their messages and taking photos. This is another product which has been in my top ten for a few years, but I still love it and think it’s a brilliant gift, so it’s going back on again this year. Combining baby walker and your little girls first dolly and pushchair is a master stroke I think. Fisher Price have got this one exactly right. The wide wheel base and sturdy handle makes sure that it’s easy for baby to push and move around. The soft and huggable plush My First Doll fits perfectly in the stroller seat, and baby will love taking her for a walk. All the while honing her walking as she goes. Second outing for the Lilliputiens team on the list, but I just love this little doctors set so much it just had to be included. This gorgeous mini doctors bag contains everything your young physician will need, even a little teddy bear patient to practice upon. The brightly coloured bag has lovely plush versions of 7 essential doctor accessories including: Thermometer, Syringe, stethoscope, medicine pot, blood pressure pump, and a white apron. It’s never to early to get the kiddos into their superheroes, and with the excellent World of Little People DC Superfriends range they wont need much persuading. Your baby will have fun for literally hours and hours with this two level playset for these chubby little superheores. downstairs has an opening garage with door for storing the Batmobile. Upstairs has the landing pad for Robins helicopter. The ramp down the side with lift off lever means Batman can jump into action and be on duty quick as a flash. Includes Batman and Robin figures, Helicopter and Batmobile. Batmobile makes fun sound effects when you push a figure down in the driver’s seat. Red Rover is a brand new game from Fisher Price, and would make an excellent gift for preschoolers this Christmas. It features an adorable red talking dog who wears a backpack on his back containing his stash of special bones. The aim of the game is to scatter the bones all around the room and listen out for which bones Red Rover wants you to bring back to him. There are 12 bones in all, all with different shapes, colours and letters printed on them. The end of each bone is shaped in such a way that Red Rover will recognise which bone you are placing in his mouth, so will be able to let you know whether you have brought him back the correct bone that he asked for or not. Depending on your players age and level of ability you can play the game on 2 different difficulty levels. You either go for the younger “puppy dog game” version in which Red Rover will only ask you to bring back different coloured bones, or you can go for the full on “Big Dog Challenge” in which Red Rover will ask for all of the different options of bones (shapes, colours and letters). My son Jacob who is 3 absolutely loves this game (as you can see from the video below) He goes mad for it, and since we received it last week he has played it at least 4 times a day, either on his own, with me or with his big brother. It’s great that it’s a game that doesn’t need much setting up, you simply open up Rover’s backpack, spread out the bones and your on your way. Jacob get’s it out several times a day and just sets it all up and starts playing on his own. It’s also great that there are lots of different ways that you can enjoy the game. When it’s just me and Jacob playing on our own we usually just spread the bones out and play it as more of a memory game than a game of speed. It’s a brilliant way for him to gain confidence with his colours and letters especially. However when he plays with his big brother Thomas who obviously being that bit older has the advantage over him. I make it more of a hunt by really spreading the bones out and hiding them all around the room. Trying to level the playing field a bit by making it more about the luck of finding rather than knowing the answer, trying to give Jacob a bit more of a chance so Thomas doesn’t win the bone every time. Whatever way we play the game it always contains lots of laughs and giggles, and everyone always has a great time playing it. There are not that many games that I can think of really suitable for younger players, but this is definitely one of them. I highly recommend it for anyone with a little one around 3-5 , and it would make a perfect christmas gift for them this year. Like every mother with a toddler aged child at the moment, I have Octonauts mad children…or should that be Octonuts! Anyway both my 5yr old and 3yr old were instantly taken with this new ocean dwelling team of aqua do gooders. After a few weeks I have now established that they all live together in the Octopod helping out marine life, but to be honest I’ve no idea why? Anyhow Thomas and Jacob seem well and truly hooked at the moment, they couldn’t care less why a bunny, kitten, penguin and Polar bear are all living under the sea together. Whilst I think about it, why does Professor Inkling who’s an Octopus, the only one who does live under the sea in real life, live in the Octopod purposely out of the water? No matter I’m probably over thinking things. The Octonauts were originally a set of 4 books by Meomi, which have now been made into a cartoon series and is later this year to have it’s very own toy range made by Fisher Price. I wasn’t aware of the book series before we watched the show on Cbeebies, so will make sure to look for it next time we go to the library as the boys will really love to read about Captain Barnacles and the crews adventures before bed. If they go down well i’ll probably buy the set of 4 too. I’m off to Toy Fair next week, very excited understandably. If theres any news on the Octonauts toys front I’ll be sure to let you know. Here are my predictions for whats going to be the most requested toys from Santa in the Christmas of 2010. Babies and toddlers are mostly forgotten about when the big toy stores do their Top 10 must have Christmas gift lists. We want to make babies first Christmas special, but don’t want to waste money on toys that are too old or that wont get played with. So with all that in mind here is the Toybuzz definitive list of perfect baby and pre-toddler friendly gifts, that are guaranteed to put a cheeky smile on your little bundle on Christmas day. Chunky pieces, bold bright colours, with rounded edges, washable, and with no small swallow-able pieces. The Playmobil 123 range of toys are suitable from 1 year old, and are perfect for little hands. Have fun not only with the animals in the farm, but also playing inside the farmhouse. Use the winch to transport supplies from outside up to the barn. This charming farm set will be sure to spark your little ones imagination, and lead to some fun and all important creative play. This fun Toddler Tool Box is perfect for Budding Bob the Builders and Handy Mannys from 18 months old. Comes with four chunky tools ideal for those chubby little hands, A saw, Hammer, Screwdriver and Wrench. Two modes of play help your baby learn Colours, Numbers and Shapes. The bright lights and colours will also stimulate your babies senses and encourage baby to play and learn. A good one for the little ones as it’s suitable from only 6 months, Potsy is more than just plastic food. Potsy will teach your youngster colours, Counting, opposites, food facts and healthy eating and more. Stirring the pot will make Potsy sing fun songs and rhymes. He also knows whether his lid is on or off. Log onto the Leapfrog online learning path and you can see how your baby is learning through play, and what you can do to help her progress. One for the girls here and I can’t believe this idea has never been thought of before. All girls love dollys and babies, and babies love walkers. It gives them independence when there at that stage when they want to be everywhere at once but are still a bit wobbly. This combination of the two is just a match made in heaven. The one problem with baby walkers is that once baby can walk confidently they quickly become redundant. However with this Fisher Price Stroller that wont be a concern as it will be loved for a lot longer as your little girls first toy pushchair. Theres even a first doll to go with the stroller which is suitable from birth. Which gives your little baby girl lots of time to get to know dolly before she starts pushing her around. The doll is even machine washable. The doll is officially available separately from the stroller but some retailers are selling the Stroller and doll as a bundle, so be sure to check what your getting. For Jacob’s First Christmas I found it hard to choose between the Playskool Busy Gears set and the Playskool Busy Balls Popper. In the end I went with the busy gears and he loved it, but now Playskool have made everything easier for parents and combined the too so we no longer have to choose. Suitable from 9 months old your baby will have loads of fun watching the ball roll down the track and spin round, and will be fascinated by the twirling gears with accompanying lights and music. Now I know that the Learn and Groove Activity Centre is not a new toy for 2010, but in my opinion it’s still the best baby activity centre out there. If you have an active baby like I did then this is possibly not only the best gift you can buy for your baby, but also for yourself too. My little boys were never big on sitting, the always wanted to be upright so this was perfect for them. Suitable from around 4 months once they can hold their heads up confidently until walking, your baby will get hours of fun and a great sense of independence from this toy. It’s also hilarious to watch your 4 month old mixing and scratching at the record decks! Another toy that although not totally new this year I still feel deserves to be on here. There are so many incarnations of the Smart Trike now as it’s been so tremendously popular, but I’ve decided to plump for the Smart Trike Deluxe. This great bike will see your child all the way from 9 month old baby up to boisterous 3 year old toddler. This 3 in 1 wonder bike first sees your little ones with a high backed seat, feet on the footrests and being pushed by mum or dad with the parent handle. Once your now toddler has grasped peddling you can flip up the footrest to reveal the peddles, and then when confident you can finally remove the parent handle and off they go! This Deluxe version comes with Removable Canopy, Handy bottle / cup holder, Toy telephone and a bag for keeping all of those baby essentials in. This cute little car either comes with a friendly mouse driver or a playful rabbit. Designed to help encourage baby to crawl the car will gleefully ride away from baby when the driver is cuddly driver is placed inside. Lights, fun music and the brightly coloured fabric help to stimulate baby’s senses, and the different textures and patterns will keep baby amused for hours. A fun little toy that baby will just love and will have her crawling around in no time. Even though babies may be too small for a full blown garage, this fun car track will do the job nicely. The raceway comes with two roller-ball cars so both you and baby can enjoy the fun together. Press the button on the front to activate the spinning racetrack, and then watch as the cars spin around and spill out onto the exit ramp and crash through the chequered flag. Suitable for babies from 6 months old, the Amazing Animals Treehouse encourages babies to sit up and play. Your baby will love playing with the three included chunky animals and really enjoy watching them have a great time sliding down the slide, riding the carousel and see-saw and swinging through the trees. Each activity the animals do rewards your baby with fun sound effects and tunes. I’ll admit now that when I bought the Imaginext BigFoot the Monster for Jacob’s upcoming birthday it wasn’t because he’d been nagging me about him for ages or because he’d seen the tv ad and decided he wanted him, I bought him because I wanted him! Don’t get me wrong I know Jacob is going to love him, but it was me that really really wanted to get this for him. BigFoot isn’t exactly cute, but he is a character which little ones are gonna just immediately love. Coming in at just over 14″ tall he’s not exactly full Sasquatch size but he is big for a toy. As the name suggests he does have big feet (which he sings a nifty little song about) and he also has big hands which he uses when he walks to propel himself along the ground. He also uses them to do handstands, exercises and to play with his favourite toy – the Red Ball. Bigfoot is operated via remote control, and not just any remote control this one is moulded onto the shape of a Big Foot (geddit?). It’s also the most child friendly remote control I’ve ever seen. Your toddler will be able to tell exactly what actions Bigfoot will perform when they press the buttons, there’s no reading required it’s all laid out in simple easy to understand pictures. BigFoot has a huge variety of different moods and actions he can perform, and just like your unpredictable toddler he can flit from one to the other in record time. One minute he’s happily playing with his ball and then he’s having a full blown temper tantrum on the floor, arms and legs kicking and flailing around. I think the kids will identify with this aspect so much and have a great time making him happy one minute then angry the next. As well as Angry and Happy he also does a good Sad and Frightened, he enjoys playing with his ball, exercising, singing and dancing, doing somersaults and handstands, eating leaves, and like everyone (especially men!) he loves a nice lay down and nap. As well as all of those actions I just mentioned he also has two different variations of all of them, so in fact he really has double the amount. For example if you press the angry button once BigFoot will have give a growl and start grring, but if you hold the button down he will fly into a full blown temper tantrum. My favourite use of this is when BigFoot goes to sleep. If you hold the button down when he takes a nap he will start dreaming, you can then press all of the other buttons and he will incorporate them into his dream. Like when you press the play ball button and he sings the tune to “Lets all go to the ballgame” or press the scared button and he will have a nightmare. Included in the box you get the remote control, a big rechargeable battery with charger, his Red Ball and a plastic leaf for him to chew on. The remote requires 2 AA batteries and the Big Rechargeable one which is included is for BigFoot. If your planning on giving this as a gift for your little ones I would suggest charging it beforehand as it takes 4 hours to charge. I managed to get it out of the box, charge it and get it back in quite easily. The 4 hour charge will give you around 2 hours of continuous playtime, this may not seem like much but BigFoot is continually on for all of this time. Even when your not pressing buttons he stands there breathing and panting and then breaks out into all of his little actions sometimes without you pressing anything if you leave him long enough. I’ll give this review an update when Jacob finally meets him and let you know how they both got on, Dec 4th is the big day. If your looking for some more Videos of BigFoot in action check out my Youtube Channel ToybuzzUK, if you check under the Favorites tab you’ll find a BigFoot Cartoon to enjoy as well. If you have an iPhone you can download your very own BigFoot App from the App Store, it has the cartoon and also an interactive Bigfoot for you to try out and a Maze game where you have to help BigFoot find his ball, and best thing of all it’s free! Ok so technically my first choice is really two choices, but I couldn’t bring myself to choose between these two great Imaginext Playsets. Both are full of amazing features like trap doors, Grappling hooks and lots of hidey holes for your little heroes. With their chunky parts and action figures ideal for smaller fingers, all of the Imaginext playsets are simply some of the best Christmas presents your little could ever ask for and guaranteed to entertain your youngster for long after Boxing Day! BigFoot the Monster is the newest creation from the guys at Fisher Price, and is part of their immensely popular Imaginext range. BigFoot is all set to become your child’s brand new best friend. Using the large chunky child friendly remote control your youngster can make BigFoot say and do an impressive over 80 actions and phrases. Whether he’s Angry, Sleepy, Hungry, Exercising, Eating or even throwing a toddler style temper tantrum, BigFoot will enthrall and amaze little ones in equal measure. Imagine how much fun you and your toddler will have Christmas day playing ball with this big guy! You can’t really go wrong with Lego for Christmas can you? and Lego fans have really been spoiled for choice this year, with tons of amazing sets being released throughout 2009. So once again i’m stumped as to which way to go, so have decided to add both Lego Star Wars and Lego Toy Story sets onto my 2010 best toy Christmas list for consideration. Being obsessed with the baddies of the movies as I have mentioned before, Thomas has pleaded with me to get him the Emperor Palpatine’s Shuttle set. Jacob however is still loving playing with the Construct-A-Buzz we have, so I’m thinking for maybe getting a Woody one to keep him company. Calling all secret agents! Looking like something that M dishes out to James Bond on a daily basis, this is your very own secret mission video watch. During their covert missions your amateur spies can record over 20 minutes of video, 4 hours of audio, or over 2000 photos. With the help of the all of SpyNetHQ.com website, young recruits can upload and review their evidence using lie detector and video analysis. Download missions from the website direct to your phone, so you can feel like a real spy having missions beamed over to you by the boss. If you are the parents to a young boy chances are you have some Ben 10 toys in your household. Well be prepared to welcome another load of cartoon monsters to your vocabulary with the arrival of the all new Ben 10 Ultimate Alien series. There’s going to be a few different styles of the new Ultimatrix out for Christmas, but the Ultimte Alien Disk Ultimatrix is set to be the most popular. Unlike the Ultimate Omnitrix the disks go inside flat, and the alien then pops out 3d. Having seen a sneaky peek of the new Ultimate Alien series online, Rath is already my favourite because he reminds me of Tony the Frosties Tiger. Following the amazing success of Rocky the Robot Dump Truck, Matchbox and the Big Rig Buddies are back with another predicted big seller Stinky the Garbage Truck. This big guy will keep the little un’s amused by telling jokes, dumping cars out of his back, singing, dancing and generally being a fun toy! This clever garbage truck has hidden sensors inside, so knows when he’s full and will stand up and tip himself out. Hot on the heels of the biggest blockbuster movie of the summer Toy Story 3, comes Jet Pack Buzz Lightyear. Press the buttons on his front to hear some of his most famous quotes from the movies. Start up his jetpack and get ready for action. Watch as the engines light up and pretend flames come out. Hear the roar of the jet pack as he blasts off to Infinity and beyond! Just be sure to set his lasers to stun, just in case you bump into Zurg along the way. Part of the new and rapidly expanding Tomica Hyper City range, The mega station is probably the showpiece. With pieces like the Police HQ, Fire Station and Petrol Station HyperCity is shaping up nicely, but what’s a town without a train station. That’s where the Mega Station fits in. Although not just a train station, there’s also an on site shop for those pre- train journey munchies. Pavement, and Parking spaces for the commuters. Full of flashing lights, sounds and impressive automation , this is a train set set to impress. Dressing up like their favourite tv and movie heroes is always a fun thing for your kids to do, although sounding like them can sometimes be a bit harder to reproduce. Don this electronic helmet and transform into every one’s favourite Bounty Hunter Boba fett. Press the buttons and hear Boba speak, shoot his blasters, and start up his jetpack. Activate the light up antenna and use it to help you hunt down your targets. By adjusting the straps inside the helmet can accommodate heads from your 5 year old all the way up to mum and dad. This is the voice changing Helmet that all true Star Wars fans have been waiting for, so if not for your son buy it for dad! Another Christmas, Another Kidizoom camera! This latest incarnation is both still photo camera and video camera. A fun directors mode lets your children have fun creating mini cinematic masterpieces featuring cartoon borders, cinema style openings. Thanks to the face-tracking technology, comical gags like a pie in your face are also on the cards. I know my son would just love making funny movies with the Kidizoom featuring all of his action figures and toys. It’s set to be big on the I want list this Xmas, Just don’t blame me when you end up on You’ve been Framed. If you remember my review of the Imaginext Batcave and Space Shuttle from just before Christmas, you’ll know how highly I think of Imaginext toys. So it’s with great anticipation that I await my delivery of the new Toy Story Imaginext toys. I’ve decided to order them for my boys as were all massive Pixar nuts as well as Imaginext fans. I’ve gone for the Toy Story 3 Imaginext playset, Toy Story 3 Imaginext Garbage Truck and the Imaginext Walking Rex. Ok maybe i’ve gone a bit overboard but Toys R Us are running a promotion of a free Toy Story Tent Rocket if you spend over £75, so it was rude not to partake of some Toy Story madness. Obviously the centre piece product is the Toy Story 3 Imaginext Playset or sometimes named Toy Story 3 Tr-County Landfill. Based on the scene in Toy Story 3 where they all end up in the rubbish dump, and have to negotiate the conveyor belt, shredders and incinerator of the landfill site. This great Imaginext set captutres all the main elements of the movie scene, and makes it into another great toy for the kids. Rescue your friends from the furnace with the grabbing crane, and drop them off to safety. The set comes with Lotso bear, Buzz Lightyear, and 3 little green alien figures. Unfortunately no Woody with the Playset, and this is primarily why I bought the Garbage truck too as that comes with a Woody figure (and also another alien). It also obviously coordinates well with the Landfill set too. With the garbage truck you can drop a figure into the orange hole on the top of the truck, and when you turn the handle it will come out the back. Can’t wait for my mega bundle of Toy Story 3 things to arrive! And I can’t even console myself by popping off to the cinema and watching it. I’ll just have to get the DVD box set out again. So Jacob’s birthday has come and gone, and we’ve had a good weekend to play and tinker with his big birthday present the Handy Manny Fix It Right Motorcycle. I knew Jacob would absolutely love this toy, due to his reaction to the feature length cartoon ‘Handy Manny’s Motorcycle Adventure’. We have to watch this at least twice a day religiously! So when I saw this I knew it’d be a massive hit. A the moment it’s not available in the UK, so I had to choose between ordering from Ebay or the US Disney Store direct. I choose to order through the Disney Store as I’d left it a little late and they offered priority shipping. However it would have been a lot cheaper to buy from Ebay, as it would have been shipped as a gift and I could have avoided customs charges. Jacob’s face was a picture when he opened it up, “Manny Bike!” “Manny Bike!” he screeched excitedly. You can see from the picture that he is pleased as punch with his new toy. The bike comes with a Felipe, Rusty and Manny figure all sporting a fetching motorcycle helmet, and Manny’s even got a leather bikers jacket complete with crossed spanners on the back. You also get a petrol can, so you can re-enact the part in the cartoon where Manny runs out of petrol. The Motorcycle has two different modes of play, there is a fix it mode and a build a chopper mode. As with the other Manny build and fix toys you get a set of blueprints explaining what jobs need to be done. Obviously Jacob is too young to see the point of this, but my 4 year old immediately spotted that they were instructions and set about putting the parts on the bike. In the Fix It Mode when you press the red button Manny and the tools set off, the engine roars and the headlamp lights up. On the second time of pressing you get the engine noise again. But on the third press the bike always brakes down. You hear the clattering of broken parts and then Manny says “uh-oh” and tells you what needs fixing. There may be a few more but I think that’s most of them, as you can see Manny Say’s quite a lot of stuff. The parts that you are able to adjust are the Sidecar, Tailpipe, Fork, Engine and wheel. You can also add gas into the gas tank. Phillipe is used to fix the Sidecar, Engine and Fork. Rusty adjusts the Tailpipe and Wheel, although there is no electronic response from adjusting the wheel. So it seems that Phillipe does most of the work, but I think that is intentional as it’s much easier for little hands to turn Phillipe than it is Rusty. My little boy has already mastered screwing with Phillipe, but I think Rusty the Wrench will take a little longer to get the hang of. He may also just be two, but he already knows that you need to press the red button three times until the bike brakes down. He especially loves filling up with the little petrol can. There is a cubby hole in the sidecar to store the gas can, and he loves getting it out, hearing the filling up noise and putting it back in it’s place. To be honest we have only been playing with the Fix It Mode and have left the pieces to complete the chopper in the drawer until Jacob is older. At the moment he is very happy with just fixing the bike, and doesn’t need the extra pieces. The build a chopper mode is essentially the same as fix it mode, however instead of Manny saying “lets fix the engine” he says “lets Switch out the Engine”. I think when he’s a bit older he will probably enjoy swapping between the different parts, but at the moment he’s fine with just the one bike. The toy Handy Manny that comes with the bike is a good size, but is smaller than the Lets get to Work Manny to give you an idea of size. Also as he is smaller, I assume he will fit nicely into the Handy Manny transforming Truck I’ve bought Jacob for Christmas. As you can see from the pictures Jacob absolutely loves this toy, and it’s been played with constantly since he had it. As it wasn’t available here it was obviously expensive to get, so I’d say if your little one wanted it more for the bike rather than Manny maybe go for something more like this Postman Pat SDS Motorbike. If however like Jacob they are Handy Manny Mad, you can’t go wrong with this! If my hubby was in charge of buying Thomas’ Christmas presents this year (rather than Santa obviously), he would definitely be receiving the Imaginext Space Shuttle and Moon Station! Even though my son shows no interest in space travel or the toy, he would be getting it whether he liked it or not. You see my hubby is obsessed with all that sci fi stuff, and loves space and the planets so this would be perfect for him. I can just see him now playing with this with Thomas. However Thomas has a list of must have toys for this year, and this is not on it, much to hubby’s disappointment. 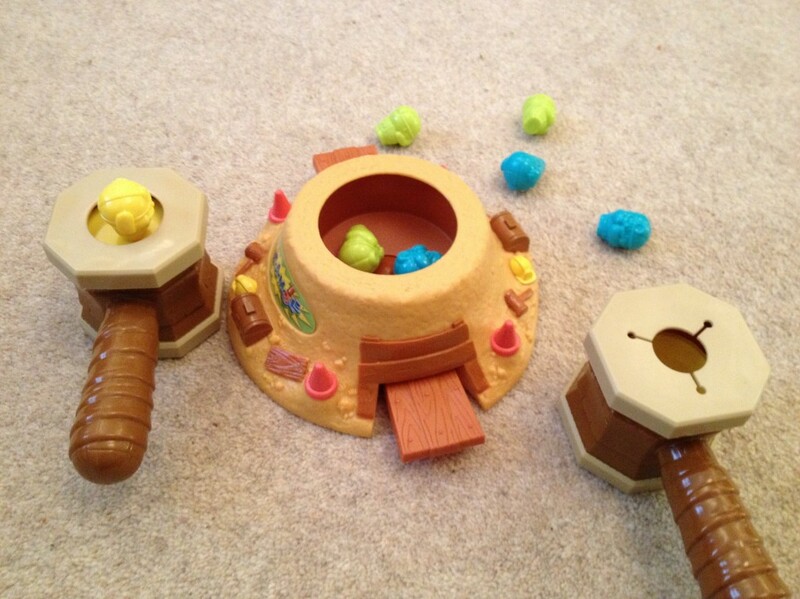 The Imaginext range of toys from Fisher Price are brilliant for little ones in my opinion. Big, bold, sturdy, durable and most importantly FUN! The Imaginext Space Shuttle is just an amazing creative play toy for a little boy who loves space. I can see junior Dr Who fans having a field day playing with this set too. The Space Shuttle comes with the tower, shuttle, a moon vehicle, Two astronaut figures and a little green alien. Just like the Imaginext Batcave toy I previously reviewed, the shuttle has lots of cool added features that make this a toy extra special. The perfect accompaniment to the Imaginext Space Shuttle is the Imaginext Moon Station. Once your shuttle has landed safely down onto the Moon base, your astronauts can have fun going out on a space walk or even face an alien attack. Theres a working rocket launcher, with which to fire projectiles at incoming enemy ships. Also a space module unit which the astronauts fit inside, ready for exploring the lunar surface. Clip the astronaut onto the space walk line, and when you turn the dial the figure floats around just like he’s really in space. My favourite part of this set though is the green alien, which can even cling to your astronaut’s face just like in Alien! In addition to the Shuttle and moon base, there are also some other great accessories to add to your Imaginext Space collection. As both of the aliens included in the sets are quite small, it’s a great idea that they have added some big scary aliens to the product line. I also love the range of extra space vehicles that you can get too. As you can see the Imaginext Space range is pretty extensive, and all together will create a massive immersive imaginative play world for your little Astronut!! And if that isn’t enough there is also a cartoon series which accompanies the Imaginext products, and the best thing about it is it’s free! You can watch all the episodes on Youtube or on Fisher Prices US site. However I suggest you don’t let the kids watch the episodes until you have the toy’s or are prepared to buy them, as they will definitely want them all after seeing these.